January was very busy with 53 rescues attended. What ever happened to the good old days back in November and December last year when rescue numbers were closer to 40 and more manageable. The extraordinary thing about January was the number of swans that got into trouble. I had to catch 25 birds! That’s almost triple my monthly average. The reasons varied but hookings and fishing line entanglements caused the most grief. No surprises there. Several other species attended during January included cormorants (3), pelicans (4), Pacific black ducks (2) …and their kids (20), plus a bevy of the Gold Coast’s ‘favourite’ bird … you know who I’m talking about (7). So, let’s get ths show on the road starting with a story about one of those ‘favourites’. The ibis below had landed in the restaurant at SeaWorld hoping for a snack. It was very badly entangled. At that late stage I knew there was little I could do to help the creature, even if I could catch it, which up until then I hadn’t been able to do. A bird which limps heavily from a visible injury attracts attention. Some people will try to catch it, always without success. Unless you know what you’re doing catching an ibis is impossible, unless that bird is comatose. Each well-meaning attempt scares it a little more until eventually the creature becomes super wary of everyone. 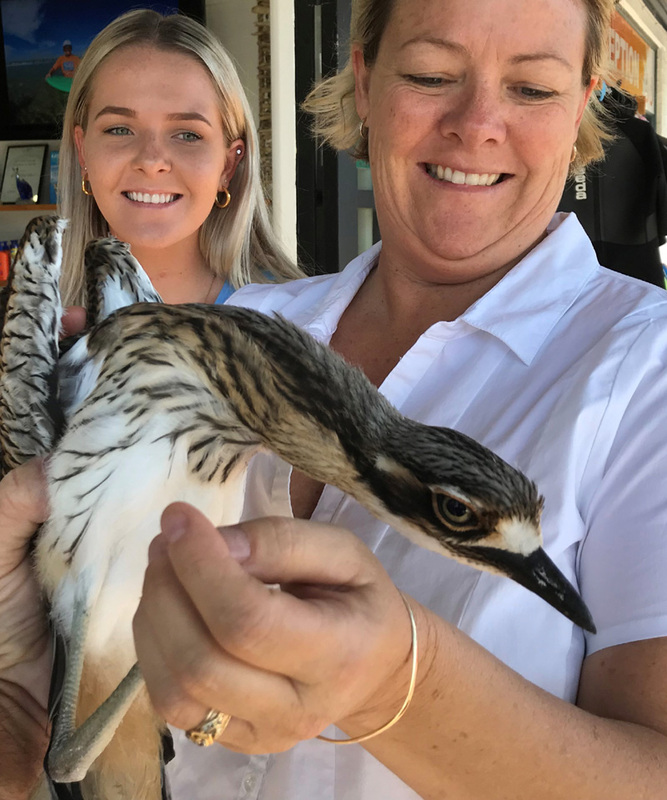 The colourful blue line entangled around the toes of this bird’s left foot identified it as one that frequents the Boathouse Tavern in Coomera. In fact I’d had three calls about it during the previous week and made several attempts to find and catch it. Clearly the entanglement had been on for much longer than the week I’d been receiving calls; probably 2 months minimum. Why nobody had called to get help for the creature a month ago when I could have saved its toes is anyone’s guess. Very disappointing. Now those toes are dead, dangling and irreparable. On the plus side, they’ll drop off any day now leaving the bird maimed but still able to cope and of course it’ll be much more comfortable. 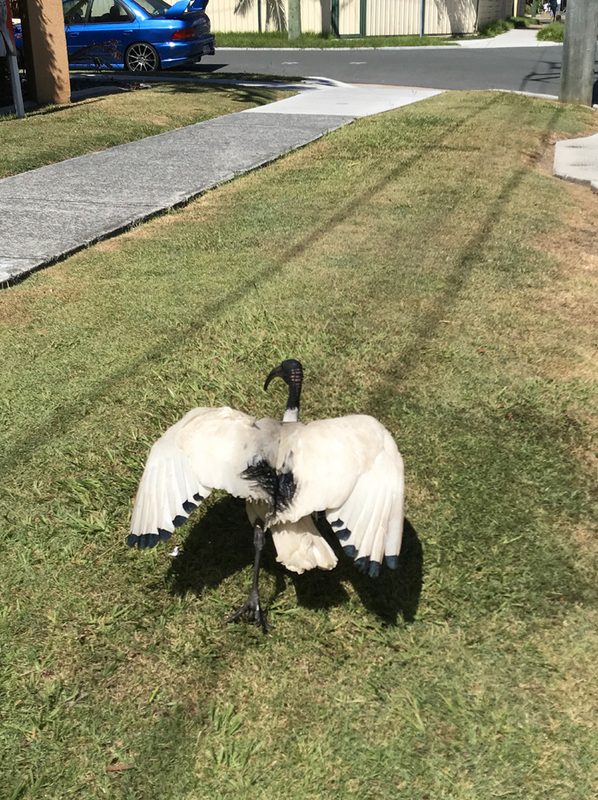 To find the ibis at SeaWorld, a full 20k’s from its home base in Coomera, was quite a surprise. Just shows how they get around. I know I’m always going on about how smart ibis are … real smart (obviously smarter than me … ouch!). But if he’s so clever and hoping for a snack why is he standing next to that ‘Don’t Feed the Birds’ sign? 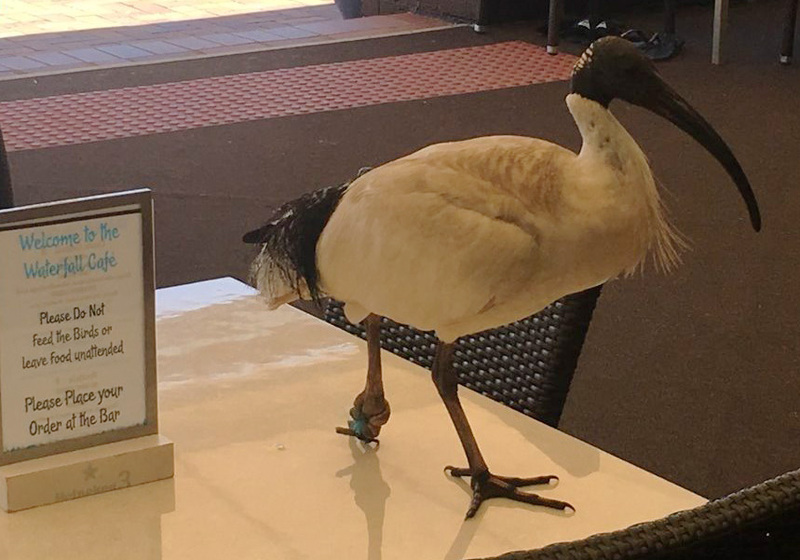 A few years ago I got a call from the RSPCA saying they’d received a report about a person who was catching ibis and selling them in his restaurant. I was shocked. This had to be one sick puppy. Mind you, not half as sick as his diners I suspect. I asked the call centre ‘where’ these heinous acts were taking place. They replied, ‘in Coombabah’. I thought wow, that’s interesting. As it happened I’d just caught a very badly entangled ibis in Coombabah. Bird had taken days to catch. I asked for the street where this dastardly ibis napper was operating? Turned out to be the same street where I’d caught my ibis. Didn’t take long for the penny to drop. 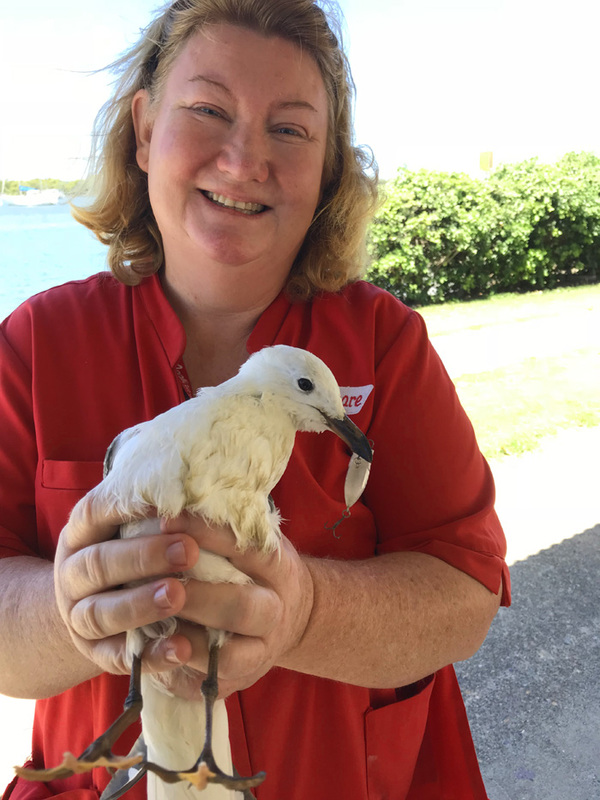 How a simple ibis rescue in a park can turn into a report about birds being caught and sold in a local restaurant boggles the mind, but there you have it. I do remember seeing a strange house on the corner of that park, curtains drawn across all windows. It was creepy. I knew somebody was home because the local ibis were all feasting on bread recently thrown into the backyard. Clearly someone was feeding those birds … someone with too much time on their hands and a very fertile imagination. I felt like knocking on the door and asking for a menu. This bunch of little rascals kept me busy in January. 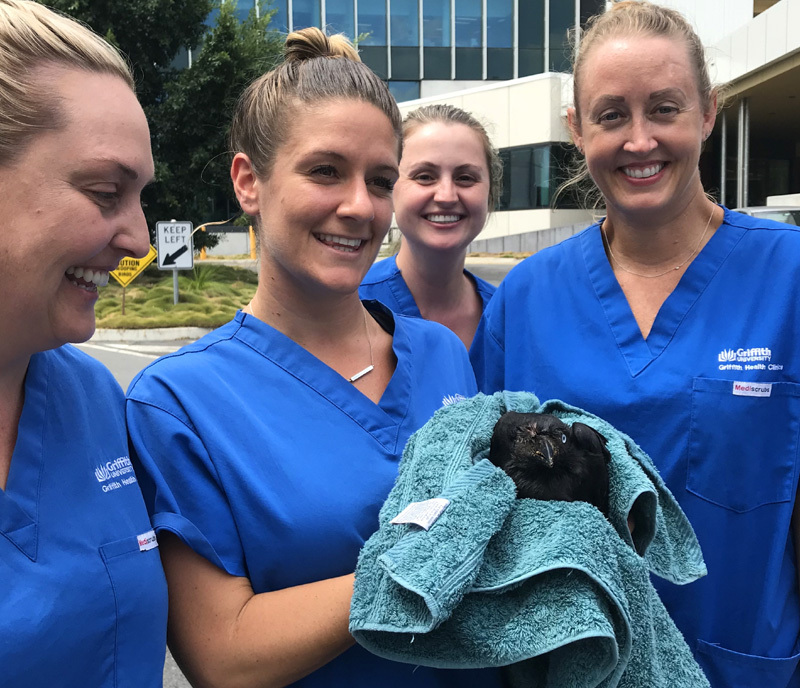 I relocated the four and their mum to Southlake, Robina after dad died in hospital from a serious wing injury sustained while fighting. His death left mum and the kids undefended on Lake Hugh Muntz (Mermaid Waters) Now they were being set upon by the new dominant swan family. Being a closed lake and having four kids that were still too young to fly meant they had no escape. The five were trying to get away from the male’s relentless attacks by taking refuge up on busy Barrier Reef Drive. That couldn’t go on. The swans on Southlake, Robina (just 1k away), where I eventually moved the five, are usually very accepting of newcomers, but lately a couple of pairs have been asserting their dominance. Our new family was set upon as soon as they arrived. Nothing serious, just the usual dust-up that most birds receive when they enter a new waterway. After a couple of days of this harassment mum bailed and left the kids to fend for themselves. She was being chased and couldn’t help herself let alone her 4 offspring. No doubt she was also confused following the loss of her long term partner. Swans don’t dwell on losses. They can’t. They move on quickly, their survival depends upon it. However, she’d still have a strong attachment to her home lake, that being Lake Hugh Muntz, a mere kilometre away as the swan flies. Due to their unfriendly reception on Southlake and ongoing harassment by dominant swans the 4 young decided to go walkabout. They ended up on Bermuda Street with cars whizzing by at 80 kph. Not a good place to be. Luckily a wildlife carer spotted the quartet as she was driving by and stopped to hurriedly push them back into the water. Close one! 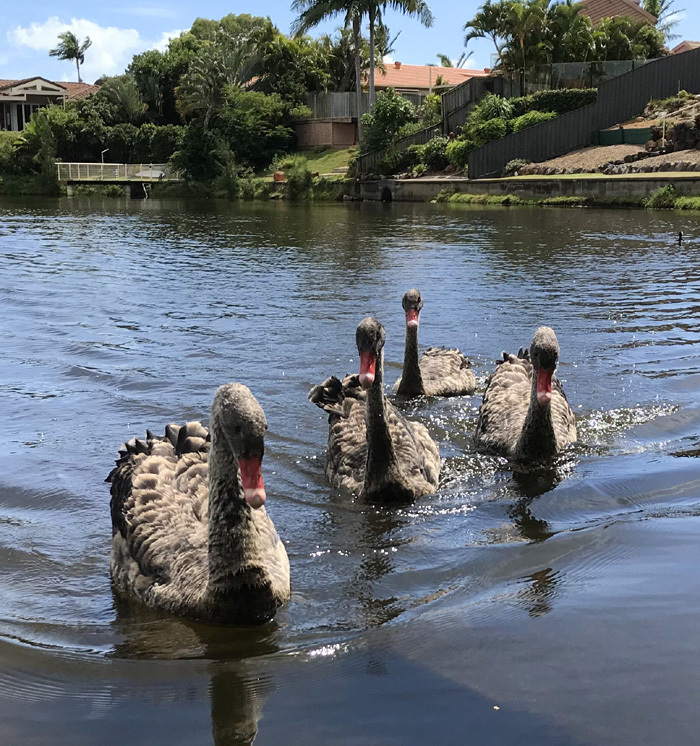 Chastened by their near death experience the cygnets returned to their little nook on Southlake near Narrabeen Drive and things settled down. However, the good times didn’t last. Can you believe that over the next week I was called to no fewer than 3 serious hookings, all in the immediate vicinity of the young swans. With each report I’d worry it was one of them. Fortunately each time the victim turned out to be a luckless mature swan. One swallowed a hook when holiday makers sent their children down to the lake armed with rods and hooks baited with bread, allowing them to fish in amongst a dozen swans. The mind boggles! Needless to say a bird was quickly hooked. It gets better. One of the parents pulled the bird in but unable to see the hook in its mouth he cut the line and let the swan swim away. I tell ya, I’ll take nutcases in Coombabah and baked ibis any day rather than that. To their credit the families were deeply remorseful and helped in a search which lasted days as we tried to locate the unlucky creature. We never did find it. Hopefully the hook lodged in its stomach where it should dissolve in the acid. A few days later I caught a second hooked swan. The hook was quickly removed and the swan released. Two days on and I caught the third bird which had a nasty little fish hook lodged in the flesh below its left hock. That creature had to be hospitalised but will be OK.
By the time you read this report the four cygnets will have matured and be ‘flight capable’, meaning they can leave Southlake, on the wing, anytime they choose. They’ll probably stay put for a while having settled in nicely, although in time I have no doubt they’ll revisit their birth lake … Lake Hugh Muntz. Then sparks will fly, not to mention feathers. In the meantime their mum has already flown back to Lake Hugh Muntz where she’s currently engaged in battles with the dominant male. This is a fight she can’t win, although without a partner or cygnets she’s little threat to him. He’ll either drive her off, or he may allow her to remain on the lake as long as she keeps a respectful distance from his family. Either way they have to work it out. While attending the 3 hooked swans on Southlake I caught Pudding, the Pacific black duck pictured at left. I’d hoped those big swellings on Pudding’s face were benign cysts; something that could be drained and any infection quelled with antibiotics. Sadly it wasn’t to be. His sinuses were completely blocked and badly infected. There was nothing the vets could do to save him. 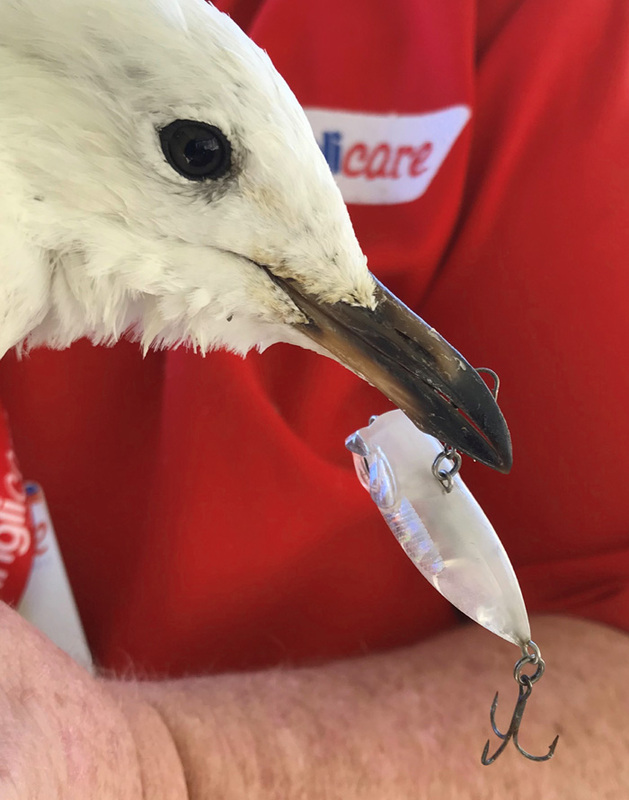 Therese called me from Jacobs Well about this gull with a fishing lure in its mouth. I’d met Therese 8 months earlier when she was part of an Anglicare group accompanying elderly folk on a picnic at Jabiru Island. They’d called me about an entangled ibis. That bird was promptly caught, relieved of a fishing line entanglement, then released. The whole adventure was the highlight of everyone’s day … everyone except the ibis I suspect, but it did get its toes sorted. Jacobs Well is a LONG way from the Gold Coast and so attending a rescue for a gull on the wing is risky. The bird could take to the air at any time and fly away. It might already be sipping a cappuccino in Byron Bay by the time I got to Jacobs. Forty minutes later I pulled into the carpark and guess what … no gull. Never mind … ‘vee have vays to fix zis’. Two minutes of burleying with my trusty Aldi preserved frankfurters was enough to bring her in … along with about ten thousand other gulls. Dealing with multiple birds always makes for interesting catching. Luckily she was super hungry having been seriously restricted in her feeding by that hardware in her mouth. Unable to resist a tasty cocktail snag she threw caution to the wind and charged in. Big mistake. I removed the hook and lure and sent her on her way. Kerry from Get Wet Surf School has called me several times about injured birds. This time it was a curlew hanging around the front of her shop. This is not unusual daytime behaviour for a curlew but Kerry was quite concerned about this bird. I promised to drop by and have a look. Turns out the creature was young … too young and silly in fact to be in such a ‘high traffic’ situation. 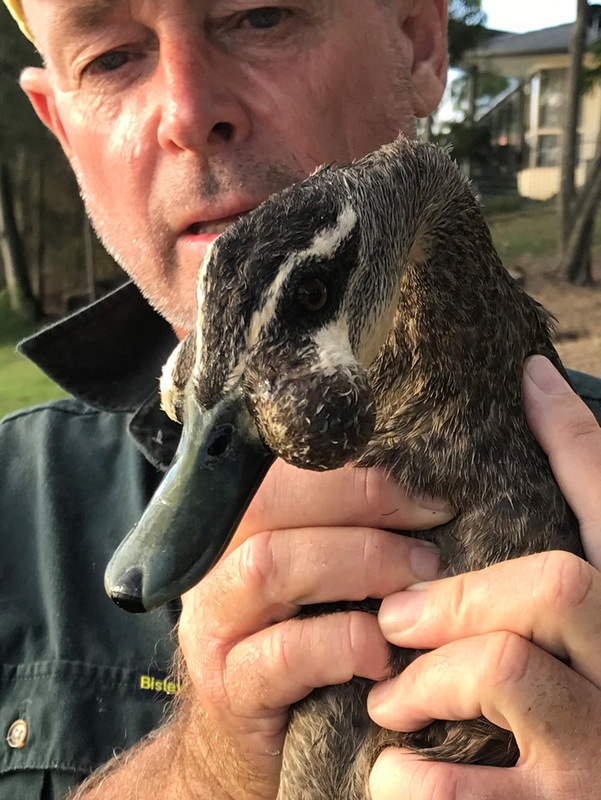 I caught it and released it in bushland among the big colony of curlews that live opposite SeaWorld, just a kilometre up the road. Next day he was back. Being a bit scrawny and clearly not making good decisions I decided to plonk him into hospital for a check-up and a few days R&R. I also wanted to break his current paterns. A week later he was successfully released in the narrow strip of bushland by the ocean, just 400 meters from Kerry’s shop. He hasn’t been back since. I’m calling that a success. 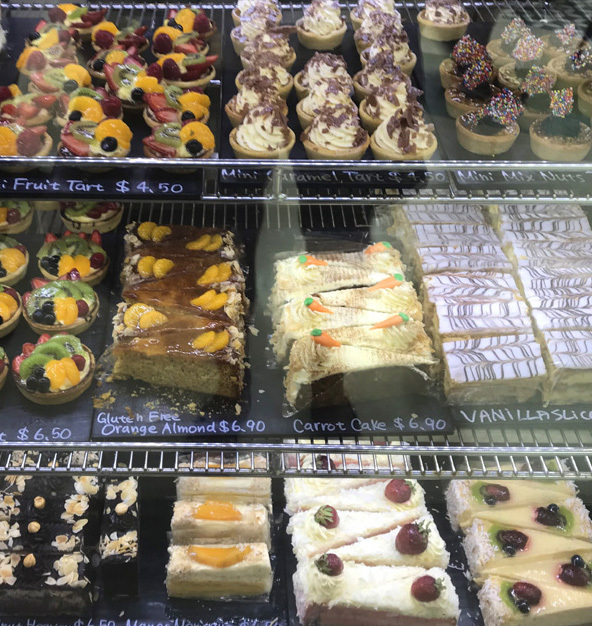 If I’d studied to be a pastry chef instead of becoming a lowly poultry slave I’d be opening the back of my car to racks of tasty cakes. The words ‘pastry’ and ‘poultry’ might sound similar but believe me they describe worlds that are far apart. Woe is me. In the immortal words of Crosby, Stills, Nash and Young I say … ‘Teach your children well’. I hope by now you’re sufficiently used to my kooky sense of humour to know that I don’t mean any of this. Except for the part about offering me tea and cake PRIOR to any rescues. Still not doing well on that front. Swans caught in January (25). Other birds caught (28). Complimentary slices of cake consumed by me (zero). January really was a dreadful month. 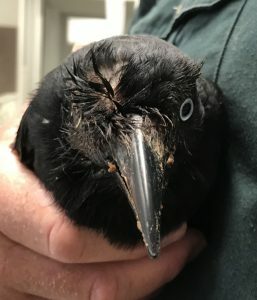 My final story features Teddy the crow. Caller Maddy sees Teddy and his mate every day. They’re regular visitors at a café at Griffiths Uni. A few days earlier Maddy noticed that Teddy’s right eye had become very swollen. He was a quick catch. I looked at the eye and initially thought ‘bird pox’. That’s the worst of the worst; a kind of bird leprosy which causes facial parts to swell, get pusy and drop off. To make matters worse pox is highly contagious to other birds meaning Teddy’s mate was at high risk. I told Maddy there was little hope and whisked him off to the Gold Coast Vet Surgery expecting he’d be put to sleep. Lucky for Teddy my diagnostic skills are about as successful as my cake campaign. Dr. Wyborn took one look and declared that Teddy had ruptured his eye ball. That didn’t sound too good either until Dr. W said he could remove the eyeball and stitch up the socket. Whoa, that’s much better. Plenty of birds out there doing just fine with one eye. The operation went well. Next day I collected Teddy and drove him back to the Uni. Maddy and her friends were there to welcome him home, all greatly relieved their little buddy had survived. By the following day Teddy had re-united with his mate and yesterday Maddy sent me a pic of the two squabbling over hot chips. This was another wonderful outcome thanks to Dr. Kevin, Dr. Wyborn and staff at the Gold Coast Vet Surgery.